Named for John Broome, a New York politician of the Revolutionary and post-Revolutionary era; his highest position was as lieutenant governor from 1804 until 1810. He was also a prominent merchant, credited with starting the importation of tea from China with an initial cargo of 2 million pounds. This block is pretty much taken up by approaches to the Holland Tunnel. 568: Our Lady of Vilna was opened in 1911 to provide a Catholic parish for Lithuanian immigrants. 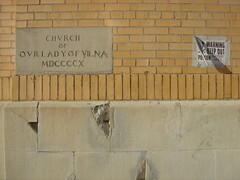 It was closed by the New York archdiocese in 2007. 539 (corner): This was the address of Tammany Hall leader "Battery" Dan Finn, born in 1845 in Limerick; he got his nickname preserving Battery Park from encroachment by commercial piers. As a police magistrate, Finn was known for dispensing picturesque advice rather than harsh sentences. Finn died at his home here in 1910; he was remembered as an advocate for the weak and oppressed. 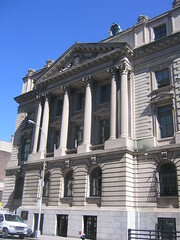 The current six-story building here dates to 1925. Officially, this two-block street has no name, but it was Clark before the 6th Avenue expansion. 525: Tailor, eclectic American, was Veruka, bilevel lounge that closed 2004. 517 (corner): Hub Center/Pony Pedicab; human-powered cabs and more at "NYC's alternative vehicle center." Corner (51 Thompson): Tunnel Garage, a 1922 parking structure named for the Holland Tunnel. 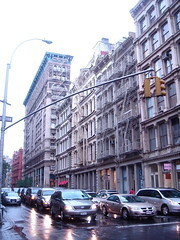 506 (corner): This three-story building was built in 2001 to house the flagship store for Tommy Hilfiger. 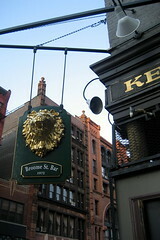 Corner (363 W Broadway): Kenn's Broome Street Bar, cozy neighborhood beer-and-burger joint opened in 1972 in a c. 1825 Federal townhouse. 495: This is the back entrance of the L-shaped Cupping Room Cafe, since 1977 a popular Soho hangout. 500 (corner): Originally a pepper factory built in 1876, this cast-iron building underwent a loving renovation in the 1990s. Dominico Vacca, men's fashion, is on the ground floor. 498: Broome Street Gallery seems to be a space where one can put on an art show if you don't have a gallery of your own. 496: Has an interesting checkerboard window pattern on the ground floor. 484 (corner): A spectacular example of Rundbogenstil architecture, in red brick and rusticated brownstone, apparently built originally as a warehouse (1891, Alfred Zucker, architect). It later served as the home of The Kitchen, an arts center. Now houses MarieBelle New York, chocolates, among other retail. 477-479: Cast-iron building constructed for the Cheney Brothers Silk Mills in 1872-73 by Excelsior Iron Works, designed by Elisha Sniffen. In French classical style with a wide variety of decorative elements. 469-475 (corner): The Gunther Building, a well-preserved cast-iron "palace" designed as a warehouse for furrier William H. Gunther by Griffith Thomas, and built in 1871-72. The floors get smaller as they go up, a trick for increasing apparent height that they're very fond of at Disney World. 480: An 1884 cast-iron building by Richard Berger. Houses Albert of Miami, Home Works draperies. 476-478: An 1872 cast-iron building designed by Griffin Thomas. The L-shaped structure is also 62 Wooster. 472-474: A stone building designed by Griffin Thomas in 1869-- one of his last non-cast iron buildings. Houses Custo Barcelona, Catalan clothing. 470 (corner): Sicis tile is in an 1867 Griffin Thomas building--made of stone, with iron columns and entablature. On the song "Trilogy" from the album Daydream Nation, Sonic Youth sing, ""From Bowery to Broome to Greene, I'm a walking lizard." 465-467 (corner): 1872 cast-iron building by Isaac F. Duckworth, constructed by Aetna Iron Works. Compromised by ground-floor modernization. Houses Alexis Bittar jewelry. 461: An 1871 cast-iron building by Griffith Thomas houses the Amazing Gallery. 457-459: Another 1871 cast-iron by Griffith Thomas. Houses Pastec, eclectic home furnishings and gifts. 453-455 (corner): The Hitchcock Silk Building is an elaborate cast-iron Griffith Thomas building from 1872-73, noted for its Corinthian columns. Houses Gourmet Garage, upscale grocery; upstairs is the hip clothing store Temperley London. 454 (corner): Kate Spade handbags etc. 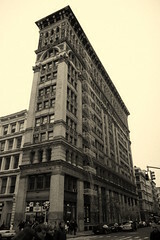 443-451 (block): A dramatically detailed 12-story building by John Townsend Williams (1896)--like a slice of wedding cake. Casket, a trade publication, was published at this address in 1930. Now houses Patina, vintage dresses. 448: This outstanding 1871 cast-iron building was designed by Calvert Vaux of Central Park fame and Frederick Clarke Withers, the same team that designed the Jefferson Market Courthouse. Houses Mango clothing. 337-341 (corner): The Mechanics & Traders National Bank Building dates to 1882 and was designed by Lamb and Rich. It houses Madewell, funky, pricey clothing with a DJ booth; was Western Spirit, cowboy stuff. 435: An 1873 cast-iron building by William A. Potter houses the Puffin Room, an art space opened 1994. 433: This building was originally built in 1827, but was given a French Renaissance cast-iron facade in the 1870s. This was the address of Gilbert & Weaver, woolen goods dealers who went bankrupt in 1876. Today it's the address of Dieu Donne Papermill is a workspace, founded in 1976, dedicated to the art of papermaking. Corner (488-492 Broadway): Pronounced "HOW-out," this landmark 1857 building is "the most beautiful commercial cast-iron building in the country" (Guide to the Metropolis). Designed by John P. Gaynor, the cast-iron facade is by Daniel D. Badger Architectural Iron Works--the oldest such ironwork in the city. Haughwout's was a tableware store whose china was used at the White House; this store featured the first passenger elevator, a steam-driven model designed by Elisha Otis. The building now houses an office supply chain and Corcoran real estate. 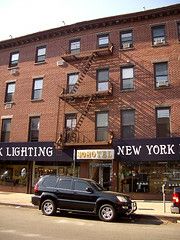 425-427 (corner): This striking 1874 building has a cast-iron facade facing Broome and a mostly brick one on Crosby. It was designed by Edward H. Kendall in the neo-Grecian style. 423: A brick-and-terra cotta store built in 1883-84 for Scovill Manufacturing to a D. & J Jardine design. Houses Nanette Lepore women's wear. 419-421: An 1873 cast-iron building designed by Griffith Thomas in an Italianate/Second Empire style. This was the building where Heath Ledger died shortly after filming the role of Joker in The Dark Knight. Also houses Aero interior design studio. 415: Substation for the NYC Transit System. 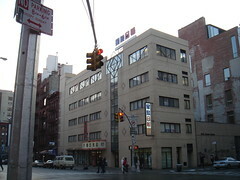 Corner (188 Lafayette): The New York office of Sing Tao Daily, a Chinese-language daily founded in Hong Kong in 1938 that claims more readers than all its competitors combined. Back when Lafayette Street was called Elm Street, the Benevolent and Protective Order of Elks was founded in a boardinghouse here in 1868. 428: Though this looks to be the same building as 426, they're actually two separate structures with different architects. This one, begun a year earlier in 1868, was designed by Isaac F. Duckworth; it has a more elaborate cornice and an L-shaped floorplan that also faces on Crosby. 426: This one of the near-twins was built in 1869 to a Griffith Thomas design. Corner (202 Lafayette): Beautiful orange-brick building with charming arches houses Dom's Fine Food, notable Italian grocery. Corner (199 Lafayette): Calypso Home, connected to the Calypso clothing stores. And/or Odin, men's boutique. Block (240 Centre): This Baroque palace, designed by Hoppin & Koen, was the headquarters of the NYPD from 1909 until 1973. It was converted into luxury co-op apartments in 1988. Supermodels Cindy Crawford, Christy Turlington and Linda Evangelista all bought lofts here; Steffi Graf and Winona Ryder are also said to have lived here. Grotta Azurra (''Blue Grotto''), originally opened in 1908 and named for a famous cave on the isle of Capri, was a favorite of Enrico Caruso and Frank Sinatra. Closed c. 1997, reopened 2003. 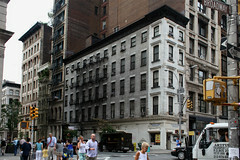 400 (corner): NYU's Broome Street Residence, home of the Upperclass Residential College. Lemast Deli & Pizza is on the ground floor. 396: Dear boutique was the China American Products Centre. 392: Sun Dat Trading Inc.
390 (corner): Was Cheong Mei Inc.
On May 8, 1922, mob boss Joey Masseria was arrested at this intersection after an unsuccessful attempt on the life of rival Umberto Valenti. 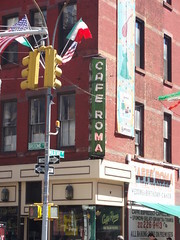 385 (corner): Caffe Roma, Italian pastries, used to be run by Eli "Joe the Baker" Zeccardi, a reputed Genovese underboss and loanshark who disappeared in 1977. 371 (corner): 38 Aquarium, fish store. Below is the Asian-themed Double Happiness, a bar ''made for trysts'' (Time Out). 386 (corner): opened in 1972, but didn't allow anything but seafood on its menu until 1996. 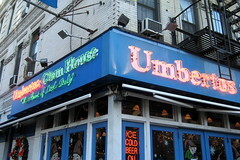 Boasts of customers like Robert DeNiro and Martin Scorcese. 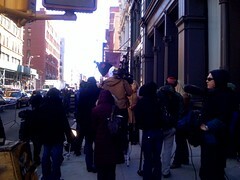 The famous mob hit happened when the joint was at 129 Mulberry. 380: Papabubble, fancy candy; Wild Ginger Kitchen, vegetarian-- was Road to Mandalay, aka Mandalay Kitchen, Burmese. 378: Most Holy Crucifix Church, Roman Catholic church built in 1926 (Robert J. Reilley, arch.). 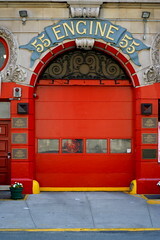 363: Engine 55 Firehouse; the FDNY company has been here since 1899. 359: Holy Trinity Ukrainian Church. An online description promises "a chance to chit-chat with older generation always eager to share their life experience with the younger ones." Was the Church of San Salvatore. 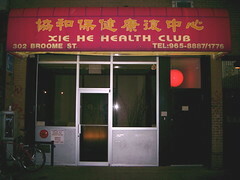 Corner (176 Mott): Funky Broome, non-Westernized Chinese with mod decor. 349 (corner): A former flophouse that is New York's longest continuously-operated hotel-- operating since at least 1805 under a variety of names, including the Westchester House, New Bull's Head, Occidental, Commercial and, more recently, Pioneer. As the Military and Civic Hotel in 1835, it was the headquarters of the Democratic Party's Anti-Monopoly faction. The two-level bar on the ground floor is Randolph at Broome (formerly M Bar), serving fancy cocktails. Also home to New York Lighting, chandelier artists. 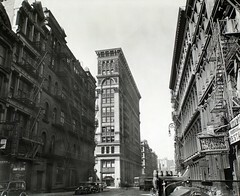 354 (corner): This 1925 building is on the site of the second home of the First Baptist Church in the City of New York, now at Broadway and West 79th. 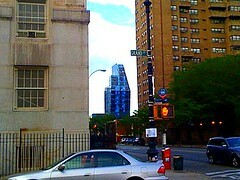 Corner (153 Bowery): This six-story, yellow-and-grey luxury condo went up in 2003. Is Oggi Lighting still here? 330: Kazuko Hirabayashi Dance Theatre is in an unusual peak-roofed building. Named for FDR's mother, a formidable woman who took credit for her son's political success, and who was something of a terror to her daughter-in-law Eleanor. The park is the result of massive slum clearance in 1929; it was supposed to be replaced with public housing, but corrupt city land deals made the price prohibitive. One block wide and seven blocks long, this park is cited by Jane Jacobs as an example of unappealing park design, though it's been improved lately. 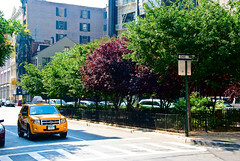 Part of this section of Sara D. Roosevelt Park was leased to commercial vendors in 1994 in an effort to get them off of Grand Street. The project, known as Dragon's Gate, did not thrive, and the vendors were kicked out after the city accused some of erecting permanent structures. The space is now used for basketball. In this community garden, established by the Forsyth Street Garden Club, Chinese men gather early every morning to give their songbirds a daily dose of fresh air. 302: Happy Ending is a hip two-level lounge in a former massage parlor--the name is massage-trade lingo for sexual satisfaction. 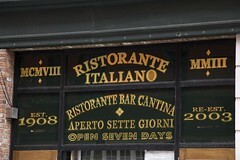 The original signage has been maintained outside, and downstairs some of the steam rooms have been turned into booths. 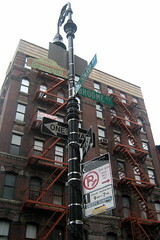 The block of Broome between Eldridge and Allen was declared New York City's smelliest block in 2011. 280: Founded in 1927 by Romaniote Jews from Ioannina (Janina) in Greece-- who trace their ancestry back to a shipful of enslaved prisoners who were being shipped from Palestine to Rome after the destruction of the Second Temple, but were forced by a storm to land in Greece, where they formed a community that has lasted for almost 2,000 years. Corner (85 Orchard): This is the famous pickle shop that Delancey is crossed for in Crossing Delancey--the descendant of Izzy Guss' first pickle shop opened on Hester Street in 1920. 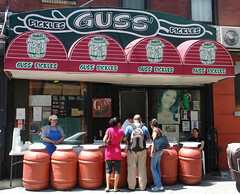 There's apparently some dispute, though, about whether this is the "real" Guss Pickles. 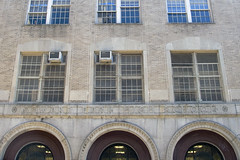 Block: The school was built on the site of the Ludlow Street Jail. Victoria Woodhull, who in 1872 became the first woman to run for president, was jailed here that Election Day for publishing an account of Rev. Henry Ward Beecher's affair with a parishioner. (As a woman, she would not have been allowed to vote anyway.) This jail was also home to William Marcy "Boss" Tweed, after he was convicted of misappropriation of funds in 1873. Though he escaped to Spain at one point, he was brought back and eventually died here on April 12, 1878. The school dates back to 1929; famous grads include Walter Matthau, Tony Curtis, Zero Mostel, Jerry Stiller and the songwriter Sammy Cahn--not to mention both Julius and Ethel Rosenberg. Today the New Design High School, an art-oriented magnet school, is on the fourth floor. Corner (75 Essex): In 1895, this stand-alone building was part of a healthcare system for the poor, which included Greenwich Village's Northern Dispensary and the East Village's German Dispensary. This one was also known as the Good Samaritan Dispensary. Now houses Eisner Bros. sportswear--founded c. 1971. 142 (corner): Beth Jacob Elementary School is an Orthodox Jewish girls school. (Beth Jacob, meaning House of Jacob, refers to the female half of the Jewish people.) This used to be the Esther Schoenfeld High School, another Jewish girls' school. 132 (corner): A four-story city-owned building, built c. 1972. At this address in 1878, Edward Reinhardt was arrested for killing his wife, born Annie Degnan, and burying her in a barrel at Silver Lake, Staten Island. He was living here with another wife, whom he married prior to the murder, and to whom he had given the dead woman's ring. Reinhardt was hanged in 1881. What am I missing on Broome Street? Write to Jim Naureckas and tell him about it. 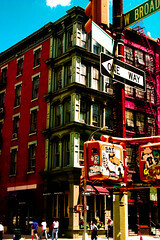 Broome Street: A Journey Through Chinatown.